The Orlando is a mid century multi-unit residence building. Through past and current renovations, its modern lines are readily apparent. The center atrium, open to the blue LA skies, the framed opening, reminiscent of James Turrell’s spacious, meditative art. The interior space, definitively modernist, is clean with attractive sleek wood-paneled dividers. The stark white interior provides an opportunity for color. This building was built in Los Angeles at a time of the explosion of the Los Angeles art scene – just at the time when Pop Art was arriving with the bright colors of a new American culture on the move towards minimalism. 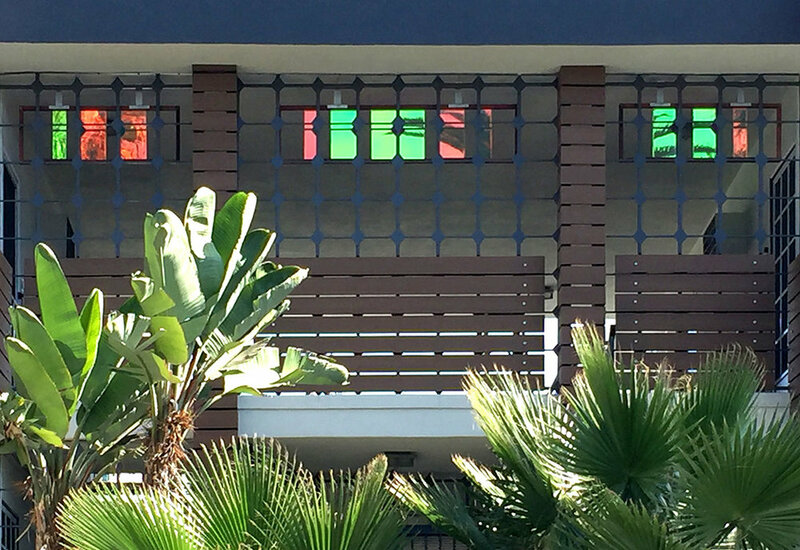 I propose to create an installation consisting of multiple colors of dichroic glass panels mounted in a minimal frame to be installed in the upper metal grid of the upstairs balcony, above the entry. This location faces West, directly into the direction of the sun, as it appears, over the course of the earth’s daily rotation. The glass will catch morning sunlight from the East and afternoon sunlight from the West. Dichroic glass is a product of thin film technology – the fusing of thin metallic films on a substrate in a vacuum, a process developed for the aerospace industry and research utilizing the physics of light. This exquisite material transmits one wavelength of light, reflects the complement, it absorbs a negligible amount of light. I use this high-tech material in combination with other raw materials to invest objects with the vocabulary of space, building on simple ideas as an entry into the greater concepts of the universe. My idea is to reduce structure to a minimum and utilize a raw industrial material with a distinctl reference to time and place. The combination of minimal raw metal and dichroic glass evokes a temporal shift in space. Installed on the second level above the entry, aligned on an East-West plane, the art installation will transmit an array of colors filtered from natural sunlight. Light will be dispersed in two directions, both East and West – towards the white walls of the interior and into the open spaces towards the exterior. The modernist framework could easily be installed onto the painted metal grid, already in place, with pre-fab bolt-on hardware or custom-made hardware suitable for this application. This installation is about the light and the great spaces of Los Angeles, the multiple colors of the City’s people. The artwork references a period of Los Angeles’ rapid post-war growth, as well as, the light speed evolution of communications, maintaining a keen vision towards the future, hope, and a connection to the greater forces of the universe.